Driftwood Cottage - Renovated Oceanfront with Stunning Views in East Boothbay! Welcome to Driftwood Cottage in beautiful East Boothbay Maine! This beautiful 2 bedroom, 1 bath cottage sits directly on the shore of the Damariscotta River, offering you unrivaled panoramic water views. Truly, this cottage has some of the very best views in the area. Set well back from the road, at Driftwood the only noise you will hear is the crashing surf below. It is very quiet! Driftwood is located on King Phillips Trail which is part of a 2 mile long road that runs directly along the coastline. The road offers stunning vistas, and is a great place to walk, jog, beachcomb or climb on the rocks. The neighborhood is very quiet, yet only 10 minutes to all of the action of Boothbay Harbor and the many restaurants and shops. It is also only 2 miles to Ocean Point and the swimming area of Grimes Cove. Driftwood has recently been renovated and re-decorated. It has all new high-end linens, down bedding, a brand new queen mattress in the master bedroom and a new full mattress in the second bedroom!! The living area has wood floors and fun cottage style furniture. There are 2 large Bedrooms and 1 bath all on a single level. The kitchen has been updated with new granite tile countertops, a new fridge and new oven. It is stocked with everything you need. The bathroom has been completely re-done and offers a large walk-in shower. Driftwood Cottage is professionally managed by Chill Properties and adheres to our very high standards. All Chill properties have down bedding and great linens. 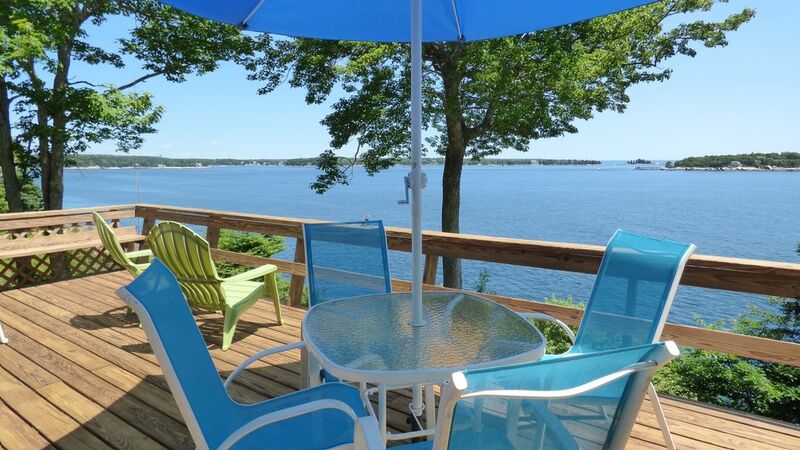 If you want a well-appointed waterfront cottage with Maine charm and all of the comforts of home, please see our link below, or google "chill vacation rentals boothbay" to make a secure on-line reservation. We accept all major cc's including Amex. -All new high quality linens including sheets, towels and duvets. This property is professionally managed by Chill Vacation Rentals. All of our listings adhere to our very high standards for amenities and cleanliness. This cottage is private and quiet!! There are absolutely stunning views throughout the house! Incredible location near Boothbay Harbor and Ocean Point. Walk out the front door and along the most beautiful 2 mile loop which hugs the coastline and goes through the woods. A wall of windows facing the water. This cottage sits directly on the waterfront unlike a lot of other cottages in this area. Completely renovated in 2014! New large shower. Easy access. Luxurious linens are provided, including cozy down pillows, high thread count sheets & duvet covers. Our duvet covers are always laundered at every turnover. We provide high quality, fluffy bath towels & beach towels. Time Warner Cable with many channels. Breathtaking view in a peaceful setting!! The cottage view is something you will never forget. A spacious and private deck with all you need to relax and take in the breathtaking view. You can hear the sound of the waves crashing against the cliff just below the property. To the right and left are adjacent properties, but you are still quite private. You are unable to see the cottage to the right due to trees, and the one on the left is set back away from the water giving Driftwood Cottage a stand alone feel. The interior is very clean and comfortable with ample windows to give you the same perfect views from inside the cottage. Kitchen is well equipped with everything needed for cooking anything you desire. A nice, new gas grill on the deck is perfect for outdoor grilling. The local area offers all you need for your stay, from groceries, fresh local seafood, restaurants, shopping, sight seeing, water activities, just to name a few. The property owner, Pam, is very nice and helpful to ensure you have a wonderful stay. Pam's welcome booklet in the cottage contains a detailed listing of everything you need to make your vacation special. Driftwood Cottage is perfect in every way! You will not regret it!!! I am so happy that I chose Driftwood Cottage to spend a week in Maine. The cottage was comfortable, clean, and a home away from home. The view speaks for itself as it was lovely to sit out there reading. or having a glass of wine. Also enjoyed staying in East Boothbay where it is not as touristy but still close enough to get to Boothbay or anywhere else you care to see. Recommend the botanical gardens! I will definitely be back to this awesome place and cottage. The driftwood cottage was the perfect location for my husband and I to spend a relaxing week. We have been to the Boothbay area several times but this was our first time staying in a rental cottage. Driftwood was a great house for us and had everything we needed. The view from the large deck is heavenly. Watching the sunrise, lobster boats and sail boats was an enjoyable part of each day. The cottage is very comfortable with a well stocked kitchen and nice bathroom. We would stay here again for sure. Can’t wait to return next year! Two weeks possible? Everything was great and we thoroughly enjoyed our stay! We had already been impressed by the pictures of the cottage and the beautiful views online, but we were even more impressed and pleased to see it in person when we arrived. It was immaculate, was well-equipped with everything we could need, and had every amenity that made our stay comfortable and most enjoyable. It was very spacious, light and bright, and updated. We had wonderful sounds of waves crashing on the rocks, and the sun and moon sparkling on the water. Lobster boats were easily in view. We were in easy driving distance to Boothbay Harbor, grocery store, restaurants, and charming other scenic places that makes the Boothbay region so magical. The property is expertly managed and all detail has been paid attention to. Great location looking out over the water - great view of Heron Island. Cute cottage - perfect for the two of us. Great deck for morning coffee and watching the sunrise. Nice quiet road and close to town. Highly recommend if you are looking for a quiet getaway. A signed Rental Agreement is required. All overnight guests must be listed on the Rental Agreement Payment - A first payment of 25% is required to confirm the reservation. Full payment due 45 days prior to arrival.